There are a lot of fun and great things to do in Fort Myers and Sun Palace Vacations can help you find whatever you’re looking to do! Here is our list of the top 5 fun things to do in Fort Myers. Located on over 21 acres of pristine land in Fort Myers, the Edison and Ford Winter Estates boast a museum and a botanical garden on the sites of the winter homes of Thomas Edison and Henry Ford. Open daily from 9:00 a.m. to 5:30 p.m., the gardens have thousands of varieties of plants and trees. Enjoy guided tours, a gift shop and much more. The Edison and Ford Winter Estates have something for everyone and provide a glimpse into the estates of two of the most powerful men in U.S. history! 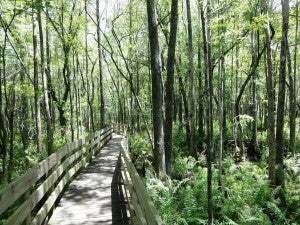 One of the most interesting sites to visit in Fort Myers, the Six Mile Cypress Slough Preserve is over 3,400 miles of wetlands. Containing many different kinds of animals, plants and other interesting components of the wetland ecosystem, the preserve also acts as a corridor for safe travel for the animals. The preserve was created in 1970 and provides education and helps keep this wonderful piece of Florida for all to enjoy. Enjoy a baseball game in the sun at Hammond Stadium! Cheer for the Fort Myers Miracle, a Class-A Affiliate of the Minnesota Twins. The season runs from April through the first weekend of September, meaning there are many chances to see the Miracle in action. The Miracle won the 2014 FSL Championship and provides high-quality baseball. With Hammond Stadium going through millions of dollars in renovation, this a great place for a game. Fans are seated close to the action with no bad seat in the house. There are comfortable, roomy suites while the rest of the fans have great seating options. The concessions are state-of-the-art with an expanded menu so you can get the full ballpark experience. Sanibel Island features many great things for everyone including the whole family! Head to the beach and relax or take advantage of the many great water sports in the area. There are a variety of activities to enjoy as you head to one of the premier vacation destinations in the United States! Head out to the beach and enjoy some fun in the sun. With many different water sports like parasailing and jet skis, there are many safe and affordable family options. Make sure to take fishing or sailing charters through the Gulf of Mexico. There are also many great areas to go shelling in Fort Myers along the beach, so you can make the most of your time outside. When traveling to Fort Myers, let Sun Palace Vacations help you find the dream vacation home. Let us help you find a great home to rent so you can spend more time enjoying the fun things that Fort Myers has to offer!